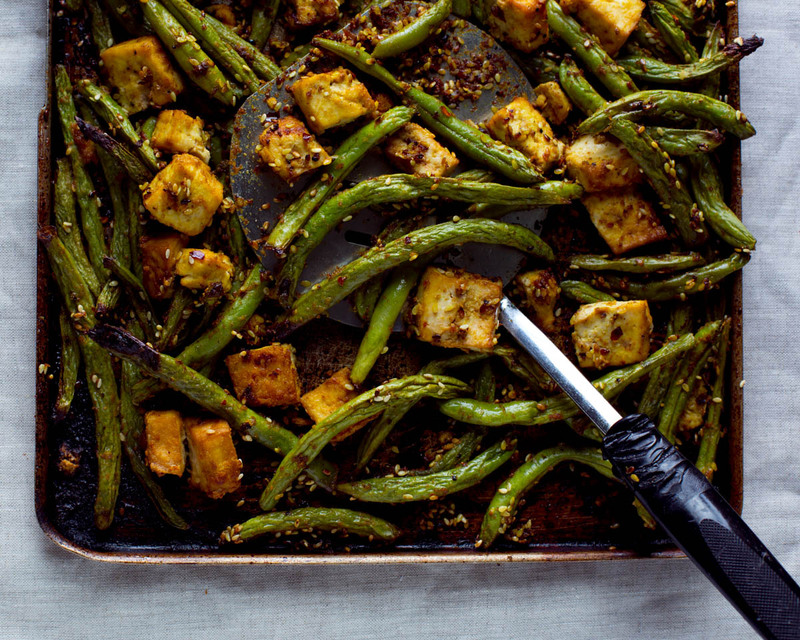 This week we’re bringing you this simple Sheet Pan Spicy Green Beans & Tofu recipe, because who has time for laborious meals? Sheet pan recipes are all the rage right now. And for good reason. We love them because you literally throw a whole bunch of stuff together on one big pan and you’re all set. The clean up is reduced to just your knives, cutting board, and pan. Who doesn’t want that? They’re also super convenient for when you’re balancing work, dinner, family, & life. Just pop that one pan in the oven and no need to worry about different cooking times, water boiling over while your vegetables are burning, and the timer incessantly going off in the background. Green beans are also perfectly in season in September. You’ll for sure be able to pick up at your local farmers market this weekend! This recipe is delicious and loaded with nutrition. Green beans are a great source of vitamins C & K, and are a good source of fiber. Plus the addition of tofu adds some plant-based protein for a satiating meal. We recommend pairing this dish with a serving of rice noodles or brown rice, for a complete and balanced meal! We’ve spent enough time talking…now let’s get to cooking. Preheat the oven to 450F. Press the tofu to remove most of the water, and cut into 1” chunks. Add to a bowl with the rest of the ingredients for the tofu, and gently mix in with your hands so all tofu pieces are coated. Set aside. In a parchment paper lined baking dish, add the string beans, and drizzle the coconut oil and tamari over the beans. Then add the rest of the ingredients for the beans to the baking dish. Use your hands to massage the green beans with the rest of the ingredients. Add the marinated tofu to the baking dish with the green beans, and bake for 10 minutes. Flip and bake for another 7 minutes. Enjoy! We love recipes like this that help cut down on prep and dish washing time, without sacrificing a hearty, nutritious meal. This Sheet Pan Spicy Green Beans & Tofu recipe goes great with whatever grains you have on hand. Do you love sheet pan recipes as much as we do? What are your favorites? Let us know what you think in the comments below! Press the tofu to remove most of the water, and cut into 1” chunks. Add to a bowl with the rest of the ingredients for the tofu, and gently mix in with your hands so all tofu pieces are coated. Set aside. In a parchment paper lined baking dish, add the string beans, and drizzle the coconut oil and tamari over the beans. Then add the rest of the ingredients for the beans to the baking dish. Use your hands to massage the green beans with the rest of the ingredients. Add the marinated tofu to the baking dish with the green beans, and bake for 10 minutes. Flip and bake for another 7 minutes. Enjoy!